My experience with the Knight Radio Broadcaster began strangely enough when I was on vacation with my family in Ocean City, New Jersey. It was sometime in the early 1960’s. My family, who then lived in Glenside, PA just outside of Philadelphia, would vacation at the Jersey shore for at least a month each summer. This particular summer there was a sewer project underway. We stayed at 57th and Central Avenue across from the beach. Installing sewers so close to the ocean required constant pumping so that the ditches would not fill with water. They used a piping system with taps connected by hoses to rods driven into the sandy soil. Suction on this piping pulled the water from the ground. I was always interested in anything electrical or mechanical so I often spent time watching what was going on. The system required 24 hours surveillance and I became friendly with the man who watched the system on the night shift. I do not remember how but we must have talked about radio and that he had built or acquired a Knight broadcaster. I will never remember the details of why he had it or if he ever used it but he ended up giving it to me as a gift. I was thrilled. I am not sure if I hooked it up at the shore but I sure did when I got home. We lived in a nice community of stone homes built in the late 1930’s. They were small by today’s standards but perfectly adequate. I had a friend, Walter Hug (See Walt's comments below), who lived about 3 houses down on the opposite side of the street. I guess I must have introduced him to the broadcaster because I remember he bought one and I assume built it from a kit. We would put on radio shows and fool his family with crazy broadcasts. One of our goals was to be able to talk two-way with our broadcasters but I don’t think we ever accomplished that. Even though we were only about 750-800 feet apart it was just too far for the little broadcaster. I do not remember what antennas were used. I am sure we experimented with lengths longer than the supplied 10 feet. It would be several years later before I was licensed as WA3DSP in 1966. Whatever happened to the broadcaster I will never know. I had many early products that were given away, sold, or outright “junked” and I just do not remember their dispositions. 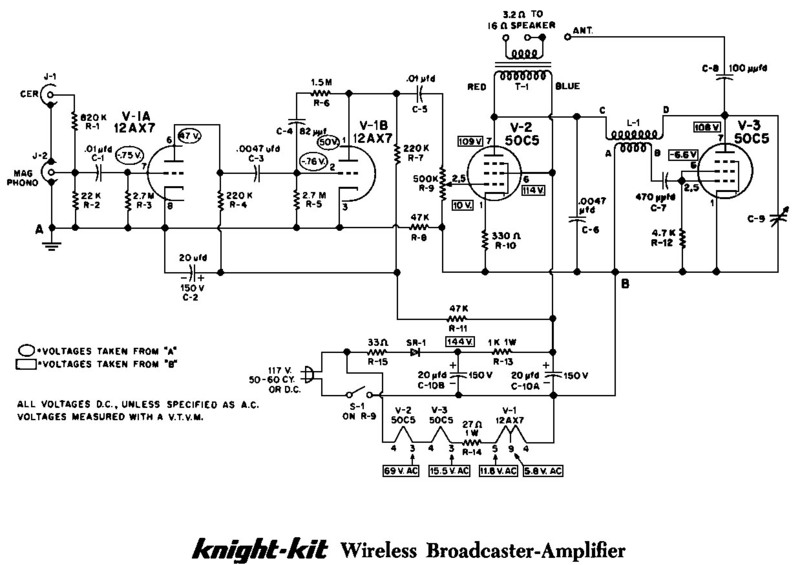 Besides the Knight broadcaster I had a Knight Span Master, a Knight Mono push-pull 6BQ5 Amplifier, A Knight VOM, Knight T60, and a Knight wired intercom that I built. Recently I have been reacquiring those items but the one that has the most memories attached to it is the little Knight Broadcaster. I can't believe you found the old broadcaster! I remember my dad helping me build it...and I also seem to remember there were instructions that the antenna couldn't be longer than about 12'....but I strung mine all the way out to the tree in the middle of our back yard...about 50 '(I think you helped me) My brother would drive my dads 57 Chevy around Glenside to see how far it would broadcast... I also remember those Allied Electronics catalogs. 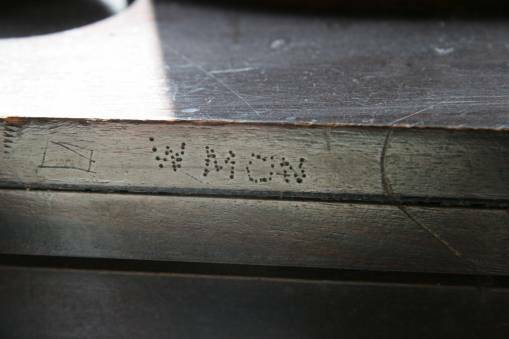 By the way, I still have the desk/furniture where I had the transmitter on - and I still can see where I wrote "WMON" into the top with a blade! (WMON stood for MONtier the road we lived on in Glenside) See attached close up of "WMON" ....guess I used a pin or needle to "engrave" this! Think this was around 1961 or so?? I also have another memory of "WMON": My parents were having a "card-party" - which they did a lot. My father had a radio playing in the living room....dialed to WMON (this was a setup) and I was playing music off of my 45rpm player (I didn't have a very big music library! )....at the appointed time, my uncle came up to my bedroom and announced on the air that the Scullys (who were down stairs playing cards), won a cruise! They couldn.t believe it! (Maybe they were pretty dense (drunk?) to think that all of a sudden this tinny music stopped and the "announcer" (my Uncle Jack) all of a sudden broke-in and announced that they won this trip. Everybody had a good laugh...and I still can picture my uncle sitting on my bed with that crappy grey microphone in his hand! I also used to fabricate / make-up commercials....after reading the news (the Evening Bulletin) on the air. Good thing I wasn't arrested...with that 50' antenna and broadcasting about a mile! 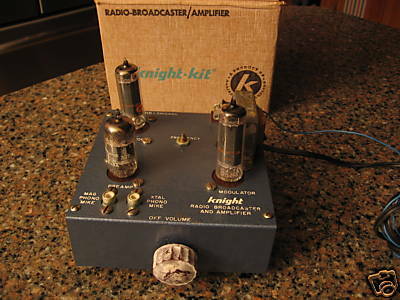 I recently acquired a Knight broadcaster on EBay and I consider myself lucky. I paid about $90 with shipping for it. It came double boxed in its original Allied Knight Kit box and it was in surprisingly great shape. Electronics prices are funny. This thing sold for about $12 in the early 1960's, probably less than $15 with shipping and taxes. Many electronics items today sell for less than their original prices while others demand much more. The Knight broadcasters because of their scarcity and the love that the original owners had for them bring a considerable markup. It had all the original Knight tubes and was built very well. Everything is original. It worked out of the box. Even though it was very clean, I cleaned and polished it. The only thing that required restoration was the maroon colored volume knob that had developed a white “goop” all over it. Using Windex and soap along with very hot water I was able to remove it and it now looks like new. I know if I still had my original unit it might not look this good, besides as a kid I often mod’ed things and drilled extra holes, etc. I cringed when I see that today. At almost 50 years old you could not expect it to look better than this. Few remain like this one. It must have been put in it's box on a shelf for most of those years. Wireless Broadcaster schematics as well as some stories by those who built and used these little gems.